As Arlo reaches 3 months I am feeling the desire to write his birth story before I forget it all. Its one of those things that is very difficult to forget, but all the details do begin to fade so I want to get as much as I can remember now so I can keep it and reflect back. My pregnancy was a pretty straight forward one. I felt tired and nauseous for the first 17 weeks. This was really difficult when trying to hide a pregnancy from colleagues for the first 12. I remember a few really bad days in the office- one straight after I found out I pregnant and stopped drinking coffee straight away. In hindsight I should have weaned myself off and not gone cold turkey as I sat in a tense meeting, with the worst headache, wanting to die!! It was horrendous!! After that I found that eating little and often would help get me through the nausea, as well as decaf coffee which worked a bit like a placebo. I finished work at 37 weeks, 3 weeks to due to date. At this point Woody also started going to nursery 3 days instead of the 5 he had been used to. This meant we got to spend some extra time together before the baby came. Our first Monday home together just the two of us we went to a morning music group in our village and the spent the rest of the day playing with toys and watching films, it was good fun!! When Woody went to nursery I sorted baby stuff, got my hair cut and did other little jobs that needed doing, as well as seeing friends. Two very good friends I made at NCT were also on maternity which made for a bit of dejavu as we sat drinking coffee and eating cake!! Just like my pregnancy with Woody, I was retaining a lot of water. My feet were getting so large that shoes didn’t really fit and so I was wearing flip flops in February. I had a midwife appointment on the Friday of the second week off work (8 days before due date) where my blood pressure decided to rocket. This was playing out exactly the same as my first pregnancy. A nice normal blood pressure for the whole of pregnancy, right until the last few weeks. I was sent off to day assessment at the hospital to monitor it. The midwife didn’t want me driving as it had gone so high, so Woody and I went home and waited for Rob to come back from work and take us there. 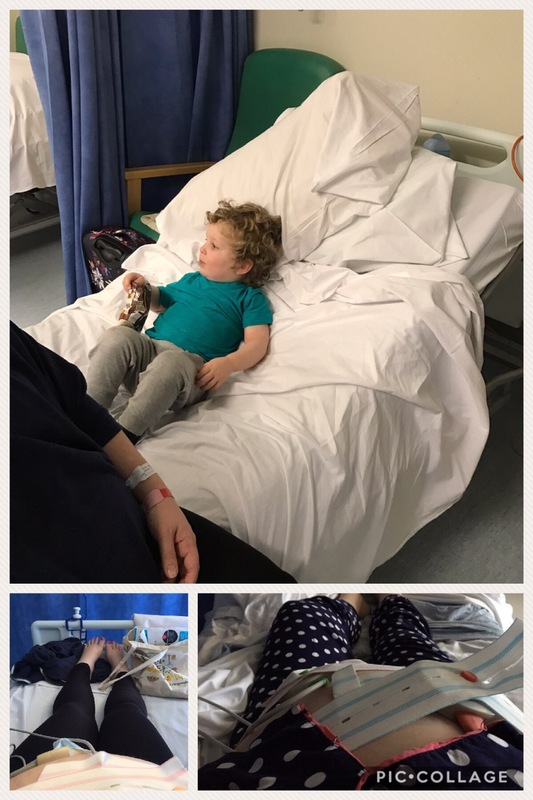 All was fine that afternoon and we got sent home after a few hours, but watching little Woody’s face while he watched my in a hospital bed with tape around my big belly made me sad and proud- sad as he looked worried but proud that he was being so grown up and such a brave big boy. 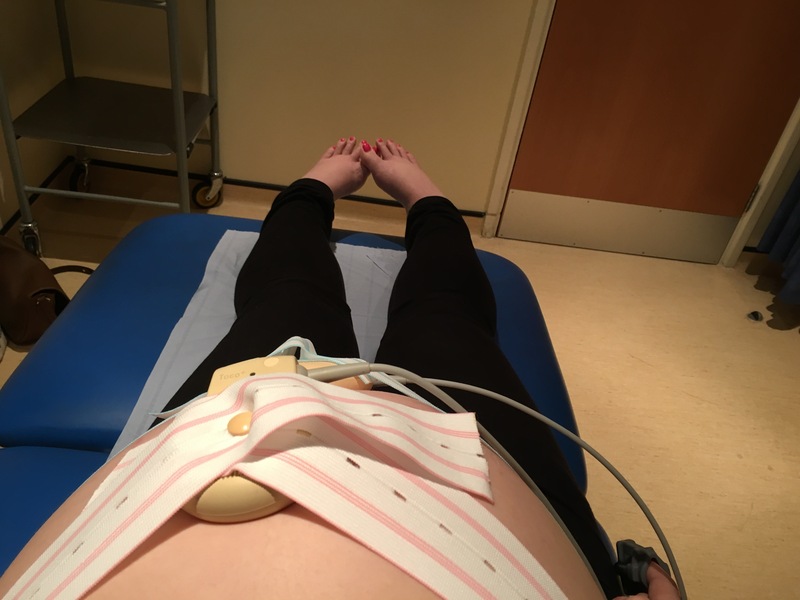 My blood pressure was to be monitored by my midwife, with my next appointment on Monday morning. As we left the hospital I called the nursery and asked if they could take Woody on Monday, if I ended up back in hospital I didn’t want him coming too. Monday morning came and as I thought, I ended up back at day assessment. It was really busy though and they were short staffed so I got sent up to the antinatal ward to be monitored there. I thought I’d be in and out just like it had been on Friday, but the doctor wanted to start me on medication to reduce my blood pressure and keep me in over night to monitor me. Rob and Woody came to visit me that evening which was nice and then I was left to try and get some sleep whilst listening to women in labour and new babies crying. Rob let Woody sleep in our bed that night- the late visit to the hospital and leaving me there had understandably made him a bit clingy. My blood pressure settled with the medication and I was discharged on Tuesday morning with an appointment to be induced at 10am on Saturday which was my due date. My mum came down later that afternoon to be close incase anything happened and to look after us all. Its amazing how much you find you need your mum in times like these! I took a lot of naps that week and we walked a lot to try and get the baby moving. Friday evening came and nothing had happened. My dad arrived for the weekend and Ron and I were all sorted for going to hospital Saturday morning (picnic packed!!) and having my parents look after Woody. As a last ditch attempt to go into labour naturally we had curry for dinner. Half way through dinner I got a very sudden urge to go to the toilet, where my bowels were emptied, I thought at the time this could have been my body preparing to go into labour but also thought this could be wishful thinking. I had an early night that night to try and get a good amount of sleep before what Saturday would bring. At about 2am Saturday morning I woke up needing the loo (nothing unusual there – I was pregnant!! ), but kept getting a twinge across my tummy. I lay in bed timing how often the twinges happened and feeling them getting slightly more intense. My first pregnancy was induced and so I had been a bit nervous about labour starting by itself and not knowing if it was real, and I had these thoughts as the twinges came and went, but after about an hour and a half I woke Rob up and said that it was happening. We decided that I should call the Labourline and see what they said which I did and we agreed that due to my blood pressure and the fact we were a good 30mins away from the hospital, we should get sorted and get to the hospital. My Dad had heard us up so helped us get sorted and off we went to the hospital (sat on a towel in the passenger seat just incase my waters broke on the way there). My contractions were happening every 3-4 minutes at this point so not too intense, but getting there. I was just focusing on each of them and breathing my way through them. These words really helped me through a lot of my contractions, as well as a saying I heard on Call the Midwife once about every contraction being one closer to your baby. At about 12.30pm the midwife did another examination to see how far along I was. When she said I was 4cm my heart sunk so far! I have progressed 1cm in 4 hours- this was going to take forever! I had a contraction mid examination though and she said that during my contractions I was moving to 7cm, which made me feel a bit better. My waters still hadn’t broken though, so she offered to break them for me. I was worried that at the rate things were progressing I wouldn’t have the energy to give birth and knew that if she broke my waters things may speed up, so I agreed that this was what I wanted. I didn’t anticipate how intense this way going to make my contractions though. As soon as they were broken, a very intense wave came one after the other. I had to really focus to breath through them as they were so strong. I really reverted into myself, not really hearing anything that was going on around me, but talking myself through each contraction – breathing, I am strong, one closer to the baby….. I couldn’t cope with silence though so Rob put London Grammar back on so we had some background sound. The waves were so intense I couldn’t really talk either, and when I suddenly felt the urge to push I just went with it. The low moaning noise I made alerted the midwife to what was going on and they started to prepare for the birth. I don’t remember pushing for that long. The contractions were coming fast and the urge to push was strong. I couldn’t hear anything though as I was so focussed, and so when the midwives asked me to move a little as the baby was pushing towards the bed, I heard nothing. Rob had to shout it to me a few times before I understood. Once I moved though the head crowned and I remember the midwives asking Rob if he wanted to have a look (an image I’m sure he’ll never be able to erase from his memory!). One more big push and he was here. He arrived at 1.37pm on the 18th February 2017. I remember asking if he was definitely a boy before they moved him to my chest. He was gorgeous! I had the injection to deliver the placenta (which was really sore!!) and gave that one big push. Once the cord had been cut the midwives took Arlo to get cleaned up. They started sounding concerned as he was a bit too blue for their liking and I remember asking Rob what was going on, but everything was fine and he soon pinked up. As they went to weigh him we all had a guess at what the scales were going to say – none of us were even close to the 9lb7 he weighed! After this we sat and cuddled and I ate toast! I then went to feed him and as I moved him into a feeding position, he knew exactly what was going on and latched straight away, like a hungry baby bird! After sitting for about an hour in the post birth haze, I went to get a shower. Once clean and sat in our room our midwife Lyn came to say goodbye as her shift was over. We had a hug and I thanked her lots for her help. She had made me feel safe by just being there looking after us but has also left me to labour and birth my baby just how I wanted to, quietly and by myself. She mentioned to Rob that she had seen a few difficult births recently and had enjoyed being part of this one as it has reinstated her belief in old fashioned birth. We were then moved onto the post natal ward, where we were given the exact same bed as we had had when Woody was born! It was next to the window so I could watch the cars going past when the curtains were open. Whilst Rob and I had been at the hospital, my sisters and their other halves had come down from London and spent the day in Winchester with my parents and Woody. They had all gone out to lunch where my sister shared the news that they were pregnant, such lovely news and a great day to share this on. I really wanted them all to meet Arlo before they went back to London, but due to a recent flu outbreak visitors were only allowed in during visiting hours. Rob went to get Woody so we could all be together and snuck in my youngest sister Sophie at the same time as she wasn’t sure when she could next visit. She managed to stay a few minutes before the midwife asked her to leave!! I got massive cuddles with Woody and then he went off with Rob to get some dinner and my mum was allowed in to be with me. I needed some help as was having quite a bit of blood loss and needed her to watch Arlo while I sorted myself. It was only about 30 minutes until visiting time began and Rob, Woody and my Dad came in. As suggested, we had Arlo in the cot when Woody came in with his bear to give to Arlo. Woody got on the bed with me and we gave him a bag with a few gifts in from Arlo. He was so pleased with this and in the cutest voice said ‘Thank you Arlo’, which melted us all. Everyone got a little cuddle with Arlo, and I got cuddles with Woody, who I wanted to protect from feeling anything negative towards Arlo, before my Mum and Dad took Woody home. Rob stayed another few hours and then headed home too, leaving me alone with Arlo. He had to have a little heel prick blood test every 4 hours due to the blood pressure medication I had had during labour, which was all fine and then just wanted to be cuddled all night. This combined with the woman opposite snoring for Britain meant not a lot of sleep happened that night! We got home the next day and began our new adventure as a family of four. Posted in Baby. Tagged Baby, birth, birth story, breastfeeding, Family, high blood pressure, labour, mum of two, new baby, new born, pregnancy.